Solas Propellers offers a variety of boat propeller products to satisfy a wide range of boat engine and boat hull configurations. The Solas propeller chart will help you choose the corect SOLAS propeller to meet your specific boat propeller application. Still can't choose the right propeller for your boat? 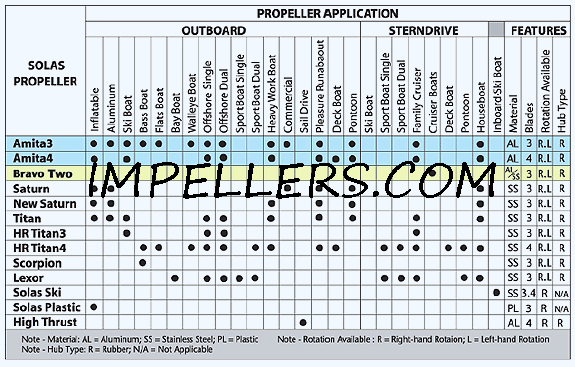 Emails us to find more information about boat propeller application. Or call us to choose the correct propeller application. 3 or 4 Blades: A 3 blade propeller usually offers top speed performance while a 4-blade propeller provides maximum thrust and smooth cruising operation. DIAMETER: Propeller diameter is the distance across a circle encompassing all of the propeller blades. RIGHT HAND or LEFT HAND ROTATION: In most cases, right hand propellers are used for single engine applications and one left hand propellers are used for twin engine applications to achieve better steering control. CUPPED BLADES: This is a technique used to enhance the performance of propellers under certain conditions. A cupped propeller will exhibit very high efficiency at high speeds as well as minimize cavitation under heavy loads. RAKE: Rake is a special design feature. Positive rake benefits from normal bow lift to permit the use of a larger diameter propeller, while negative rake can provide extra blade strength for use in very high speed application.